Ahh, I have a day off. That can only mean one thing - it's time for another mission into the Big Smoke to sniff 'round some crates. Who knows what lies in a dusty crate or rack somewhere, just waiting to be handpicked. You can spend all day searching for wax on the internet, but nothing equals the buzz of finding a gem in the flesh. I admit these days the pickings aren't great in one spot alone, so it's time to switch to military precision mode and make a plan of attack on the city's record shops. 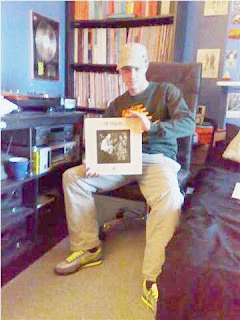 I'm fast and furious, and many fellow record heads complain as they cannot keep up with my power-digging style. But when I've got my eyes on a prize there is no holding me back. I like to dig deep & fast, scoop the beats, and then move on to the next target before I'm recognised. To my fellow diggers, I'm sorry but it's like that, and it means that on most of these missions I have to fly solo. The only tools I will be taking is a handy portable, and my spideysense. I often rely on diggin' hunches rather than go for the obvious stuff, and the record in the picture above is a perfect example. It's the JOHNNY DANKWORTH and PAUL HART QUARTET LP entitled "Octavius". I believe DJ PREMIER has a liking to DANKWORTH samples, so this was a purchase based on this hunch and the other JD records I own. And to be honest, this LP is probably the best of them, featuring 2 clean drum breaks to chop, plus some killer loops ripe for a hip hop track. I'm not gonna give the whole game away, but take a peep of "Long John" and see what you think. 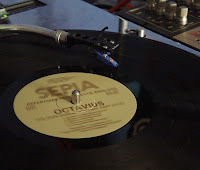 JOHN DANKWORTH PAUL HART OCTET - "Octavius" LP on SEPIA RECORDS 197? Easy Dom, any luck yesterday on your `diggathon`..? Hope to hook up soon Kid..! Word! Great score. Keep the quick diggin action going, let everyone else catch up! Yes indeed, like Chuck Norris there is a "code of silence" in this field and you gotta keep "movin'on" as quick as either Keith E. E or Master Ace can say it! Plus i guess it's best to rock ya hard-wear Timbalands whilst on a covert diggin' mission with Dyno then, to save sneaker sole meltdown = more loot for wax. 'Sup Dom? - There are a few DJ's &/or Producers who truly elevated the crate diggin'/beat makin' genres and Primo definitely is one of them. I think he used a tiny bit from a track on David Byrne & Brian Eno's My Life In The Bush Of Ghosts album for some weird bit on "Words I Manifest" (it's a brief sample but trust me you KNOW it when you hear it.) But one of THE coolest and strangest bits he sampled has got to be heard on Gang Starr's "The Militia." Primo actually used a bit of the theme song to a US TV show called "Dark Shadows" (I think it was like the first Vampire/Fantasy/Soap Opera type show in the US back in the early 1970's) for "Militia" and it still blows my mind today. I downloaded your BREAKS FOR DAYS AUG 09 show and it was VERY dope mayne. And believe it or not one of Ian's MC friends Subtext rhymed over that track you played with the whistling in it (I don't know the song title but I'm sure you do) near the end of your DJ set. If you want to hear the track please let me know.